Close-up image of the jarrah nave altar at St George’s Cathedral in Perth, Western Australia. 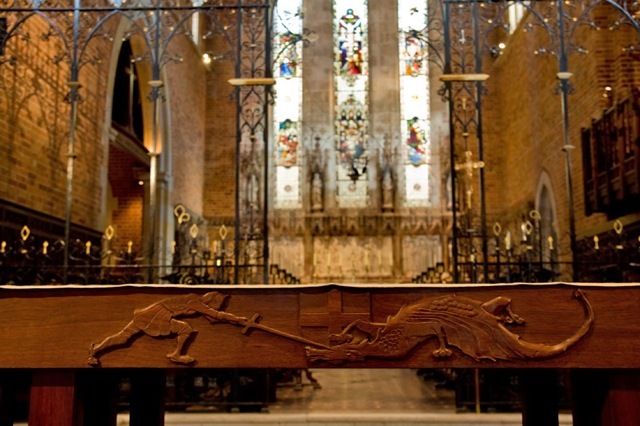 The altar features a hand-carved knight and dragon against a St George shield to portray the St George legend. It was carved by Robin McArthur and installed in the Cathedral in 1991. The addition of this new altar at the head of the nave enabled the Eucharist service to be conducted closer to, and facing, the laity. Continuing the traditional associations of Christianity with military service that are present throughout the Cathedral, the image of St George as an armoured knight has the effect of, as Andrew Lynch has suggested, conflating piety and prowess in a positive way. The legend of St George slaying the dragon is Eastern in origin. It is thought to have been brought back to England by crusaders and was popularised and incorporated into hagiographies of St George in the medieval period in works such as Vincent of Beauvais’ Speculum Historiale and Jacobus de Voragine’s Golden Legend (c.1260). As with most Australian images of St George and the Dragon, the image features the knight and dragon in combat, and there is no sign of the maiden who was being saved in the original tale. For more on the St George legend in Australia, see Andrew Lynch, “‘Thingless names’? The St George Legend in Australia”, The La Trobe Journal, vol.81, Autumn 2008, pp.40-52: http://www3.slv.vic.gov.au/latrobejournal/issue/latrobe-81/t1-g-t4.html). 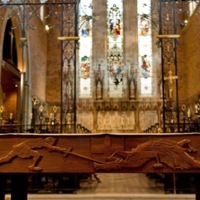 “St George and the Dragon Altar, St George’s Cathedral, Perth, WA,” Medievalism in Australian Cultural Memory, accessed April 25, 2019, http://ausmed.arts.uwa.edu.au/items/show/602.